You have the ability to add people or exclude people from an automatic directory feed. The preference is to correct the error IN the Campus Directory but when that isn't possible, you can do it manually. To manually add or exclude individuals from the automated feed of selected people types, set the Manually Add or Exclude Individuals from the Feed option to Yes (by default it is set to No). When the option is set to Yes, enter the CruzIDs (do not include the @ucsc.edu) separated by commas. If a CruzID is not recognized (i.e. if it is entered incorrectly or the individual has left UCSC), it will not be included in the directory. 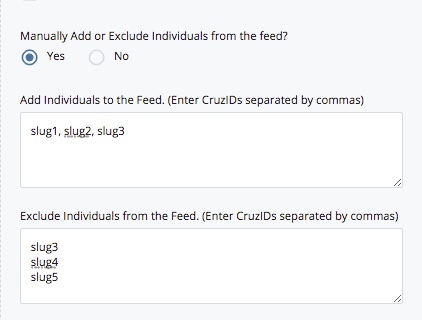 If you need to add an individual, simply insert the CruzID where you would like them to appear in the custom list. To remove an individual, simply highlight the specific CruzID (and the comma that follows it) and press Delete. You can list a vacant job position in the list of CruzIDs. For automatic feeds, vacant positions will appear at the end of the list. In a custom list, the vacant position will appear wherever you insert them in the list.